The deluxe knee pillow restores natural body alignment by adding a space between your legs when you are laying down and aligning your hips for a natural resing posture. This molded contour design helps reduce tree on hips, knees and ankles. 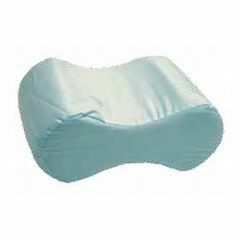 Molded contour pillow is 10" x 8" x 5.5". Comes with a removable, washable polyester cotton cover.